18) HOW TO ANSWER THE INEVITABLE QUESTION: WHY SHOULD I CHOOSE YOU? mag@topagentmagazine.com | www.topagentmagazine.com call him at (281) 300-0175 or email him at rbparr@cbunited.com www. No portion of this issue may be reproduced in any manner whatsoever without prior consent of the publisher. 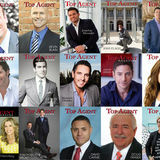 Top Agent To learn more by about Biddle call 972-333-0301, Magazine is published Feature Lisa Publications GA, Inc. Although precautions are taken to ensure the accuracy of published Copyright Top Agent Ma To find out more about Julie Schuchart, email Julie@t materials, Agent Magazine cannot be held responsible for lisabiddle.com opinions expressed or facts supplied by its authors. email Top lisambiddle@yahoo.com or visit call 979-571-1725, or visit tm5properties.com/agen To subscribe or change address, send inquiry to mag@topagentmagazine.com. Published in the U.S. To learn more about Cristina Edlin, visit cedlin www. it’s a few key talking points or to have a few questions ready ahead of time in a Q&A, in case incoming comments slow down. Consider an external microphone to make sure your viewers can actually hear you. And if the live option makes you a little nervous, you can also stream pre-recorded videos. Hey, that has worked like a charm for TV for decades. Some businesses promote their web series to “air” on Facebook Live at a certain time like TV shows. After they are streamed, Facebook Live videos function as normal Facebook videos. Some business owners believe videos may perform better if they begin as live ones. NowThis, a news company that publishes entirely on social platforms, experimented by streaming a 38-minute compilation of its favorite viral videos via Facebook Live. The stream received over 20,000 views and over 500 comments, according to Facebook’s counters. Yes, all the new-fangled internet tools, apps and options for REALTORS® can be a bit overwhelming. Just take it one step at a time and you’ll slowly be right there in the business-winning mix. E-mail me today at Article@CorcoranCoaching.com and I’ll send you more free information about how technology can help your real estate business. Copyright©, Bubba Mills. All rights reserved. 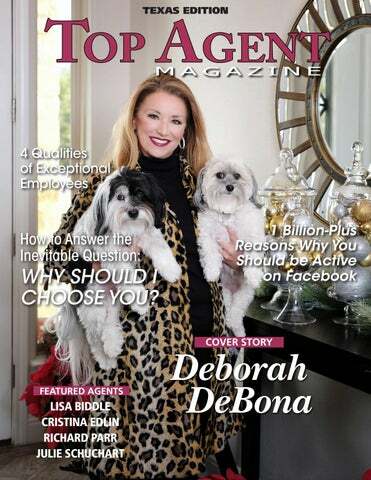 Top Agent Deborah DeBona is based in Austin, where she serves the North Austin region under the banner of Reilly Realtors. To learn more about Deborah DeBona email Deborah@ReillyRealtors.com, visit DeborahSellsAustin.com, or call (512) 790 â&#x20AC;&#x201C; 1550 www. you are and if that’s the type of person they want to work with. WHAT ARE YOUR INTERESTS? Real estate might seem like your entire world at times, but you also have a life outside of work. Maybe you like music or traveling or being outdoors. The best part about being a realtor is that there are often ways you can thread these interests into your work, like hosting client functions and events. WHAT DOES YOUR CLIENT CARE ABOUT THE MOST? Let’s face it, your clients likely care the most about only a few things: saving or making the most money, doing it as soon as possible, and making sure that doing so isn’t too stressful. Your response to your client’s question—why should I choose you?— should address these concerns. Maybe you excel at creating systems that make the selling process efficient and profitable for your client. Or maybe you excel at providing a personalized experience for homebuyers. Try out a few responses. You might even start with a template: My [skills or passions] helps me [provide this service] because I can [achieve my client’s goal]. Like most things in life, coming up with a compelling and concise response for why clients should hire you will take time and practice. To find out more about Richard Parr, visit his website at coldwellbankerhomes.com/tx/houston/agent/richard-parr/aid_95379, call him at (281) 300-0175 or email him at rbparr@cbunited.com www. JULIE SCHUCHART How did Julie Schuchart become a rising star in real estate in Brazos County? A native of Bryan-College Station, Julie worked at A&M for fifteen years where she ran a program certifying secondary school teachers. At the same time, she worked part-time for the A&M Athletic Department where she supervised the Founder’s Suite at Kyle Field, all while raising children as a single mom. She finally decided to follow her goal of becoming a real estate agent and studied for and received her license in 2016. She was invited to work for TM5 Properties—which was her dream brokerage—and she joined up with them and soon had a thriving business. In her first six months, she did an impressive $1.5 million in sales, and in 2018 she closed over $4 million in transactions. “At TM5 I’ve had great mentoring with the broker and the mentor team. I have a passion for the business!” she says with her characteristic enthusiasm. She now serves Brazos County and all surrounding counties. Already, the majority of Julie’s business comes from referrals from past clients. What keeps her clients eager to sing her praises to their friends and family? “I focus on problem-solving and coming up with solutions,” she says. “I run to the noise. If there is an issue, I like to meet it head on. If there’s a problem, I work to figure out how to solve it so we can get to the closing table, and make sure everyone is happy throughout the process.” Staying in touch with past clients comes naturally to Julie. “We become friends, send birthday cards and Christmas cards, and call each other to say, “Hey, how is everything going?’” After working with Julie, her clients rave that she’s honest, personable, genuine and incredibly professional. “I’m realistic with them, and they appreciate that,” she says. When it comes to marketing listings, Julie works with clients to set a competitive price. She then has professional photographs taken of each listing, and for land and luxury properties, she hires drone photographers as well. She promotes each listing thoroughly on social media—where she has a huge following of people who appreciate her positivity—which often results in a sale before a property is even listed on the MLS. She posts properties on all the major real estate websites, her personal page, business page, and the TM5 website. What’s her favorite part of her new career? “When someone walks into a house you can tell when they fall in love,” Julie says. “You can see them light up and say, ‘Wow!’” To give back to the community, Julie and the other agents at TM5 run a large food drive each year. She’s involved in the Spirit of Texas Festival to raise money for the Boys and Girls Home and other worthy nonprofits, and she fundraises for friends and community members experiencing illness or other difficulties. Julie’s husband is a marathon runner with a goal of running a marathon in all 50 states. Julie loves to travel with him to races to support him and see new places. In her free time, she loves restoring furniture and designing and renovating homes. Recently Julie has partnered with an investor to start her own home renovation and restoration business. Her five year goal is to receive her broker’s license, become an associate broker at TM5, and grow her own team. Now those are worthy goals that—with her passion and natural talent for the industry—she’s sure to achieve! To find out more about Julie Schuchart, email Julie@tm5properties.com, call 979-571-1725, or visit tm5properties.com/agents/julie-schuchart www.